I'm curious why PCBs have one square pad in row for 0.1" headers. What is purpose of putting one square pad? What it indicates? Can you push more amps through square pad than round? This is to identify which pin is "pin 1". In the case of a single-row header with no orientation key, this might not really matter, but the layout tool might do this by default and the designer didn't think to turn it off. 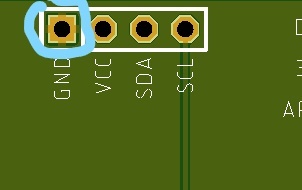 If this were to be used with a connector that does have an orientation key, I'd much rather also have a pin 1 indicator in silkscreen, so that the orientation can be checked after the connector is loaded (and without having to flip the board over). Can you push more amps through square pad than round? No, it won't cause any significant difference on the circuit performance. Not a standard, but it's useful to mark where pin 1 is. This might be useful if you don't have a silkscreen, but you wish to mark the orientation of the socket. It is there to mark the location of a specific pin (mostly pin 1). It helps in deciding the orientation in which a component should be placed. No you can't push more amps through the square pad. Check to see if the trace running to that pad is wider than the other traces, if not than it is similar to the others. The square pad doesn't make a electronic difference when compared to round pads. Not the answer you're looking for? Browse other questions tagged header pads or ask your own question. THT: What is a squared annular “ring”? Is there any way to force square header pins into round holes? epoxy for keying box headers? How to create custom through hole pad shapes in Altium Designer? Intercept pin headers, three way or the header?